I have been collecting shell art for many years, but didn't realize it. I have always been attracted to little trinket boxes made out of shells to hold earrings at bedside. One day I looked around and realized that I had more than a few items of this art form. Here are a few of the pieces in my collection. The shells on this vintage lamp have turned a lovely amber color. It sits on a desk with the box above and a sea shell frame that is new. There is a big difference between new and vintage. This frame from Z Gallerie is new. However, these bookends are definitely vintage. A rare example of vintage shell tramp art. I was told this is French. This wonderful old lighthouse night light was a recent find. The shells are glued on cardboard. Another recent find is this shell mirror. It probably started out as a picture frame. Also known as a "Sailor's Valentine." 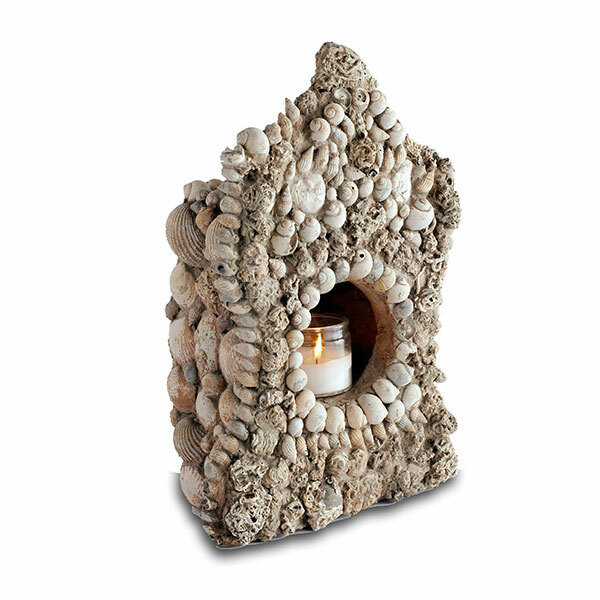 This shell art lantern arrived today from Wisteria. It is much larger than I thought! Although it isn't vintage, it will be great up in the wine country on a warm summer night. This is the first in a series I am doing about collecting, featuring my own collections, as well as others. I am fascinated by what people collect and am always interested in learning about what makes something desirable as a collection. Love it all!!! Shells are one of my favorite things to collect!!! I see that you are a Californian. I was born in Texas but grew up in southern California...La Jolla. We still go out every July and stay for a month or so and for a shorter trip in March. I wish I was there right now...it is soooo cold in Texas!!! Pretty collection. Thanks for sharing it with us. I still would love to hear about everyone's collections. Maybe I should have a "blog party" and have everyone send their favorite collections! Wow! I love seashells..., but have yet to collect enough to create a display. WOW! I too collect shell pieces, mostly boxes. You have a wonderful collection. And the new piece by Wisteria-beautiful! I have been jumping from one story to another around your blog this morning and loving every single post, your kitchen, dining room, these shell collections and your divine Majolica collection. Your do have the most gorgeous things and I have to say that I have also have very similar items in my home, however I just don't have the room or the cupboards to display them all like you do. Your home is such a wonderful place, you must be in heaven creating everyday. I can see it in all your images.